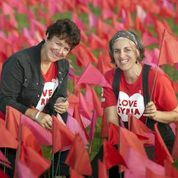 The giant heart was planted for just a day by the Jamaica Inn at Bolventor by Caroline Cleave and Franca Westaway to raise awareness and money for Oxfam's Syria Crisis Appeal. It'll be planted next in Totnes and then, maybe Exeter, before going on a tour of Britain. like coming back to Port Isaac one day to find our house and the business all gone." Oxfam is working with refugees from Syria in Lebanon and Jordan and is aiming to reach over 650,000 people in the coming months. The charity is also calling for urgent peace talks world leaders have promised without further delay.